Check out this little beauty, featuring Mickey Rourke as Whiplash. Rourke killed as the anti-hero Marv in Sin City, and here he looks like he's going to do it all again as the villain of Iron Man 2. This is shaping up to look pretty awesome. They're doing a very good job teasing with the posters. Also, an awesome little easter egg- the newspaper clipping over his right shoulder blade is from the Toronto Star (it says "Tony Stark is Iron Man"- that's my local paper! Nice Justin! 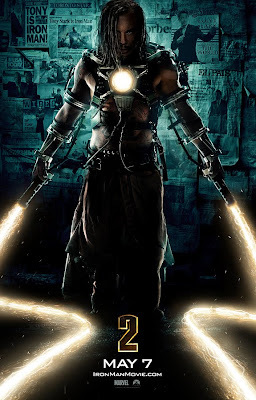 You might have to keep watch on the Star by the looks - as the new viral Iron Man 2 campaign takes off! Check out the story above for details - and thanks for posting!